The perfect getaway with your spouse, family, or friends on 180 feet of personal lake front property. Newly remodeled with brand new bathrooms, fresh paint, new furniture, and new flooring. •	Dogs welcome for an additional fee per dog per night. •	Tents and campers are an additional $25/night per item. We do not have a plug in for RV/Fifth Wheels. WEEKLY DISCOUNT: Stay 7 or more days (6+ nights) received 15% off your entire stay upon request. You must mention this when messaging the owner before you confirm the booking. Please note: the house does not have heating, but space heaters are provided. Both bathrooms were completely remodeled in 2015 with beautiful tile work; new sinks, toilets and fixtures; a well as fresh paint and new flooring. Dining room seats 4; porch seats 6 at indoor picnic tables. Great stay. Would go again. This cabin couldn’t have been more perfect. We had a small bachelorette weekend trip and it was great! Nice and quiet, plenty of sleeping areas, plenty of space for everyone to sit and do mani/pedi’s and fun paddle boat. Everyone wants to come back soon! Exactly as advertised! Family said more fun and enjoyable than a hotel ! Parking was a bit cramped, but you soon learn to handle it. House very pleasant. Beds comfy. Lake soothing. Property was wonderful!!! Just what we were hoping for!! Everything was amazing during our stay! 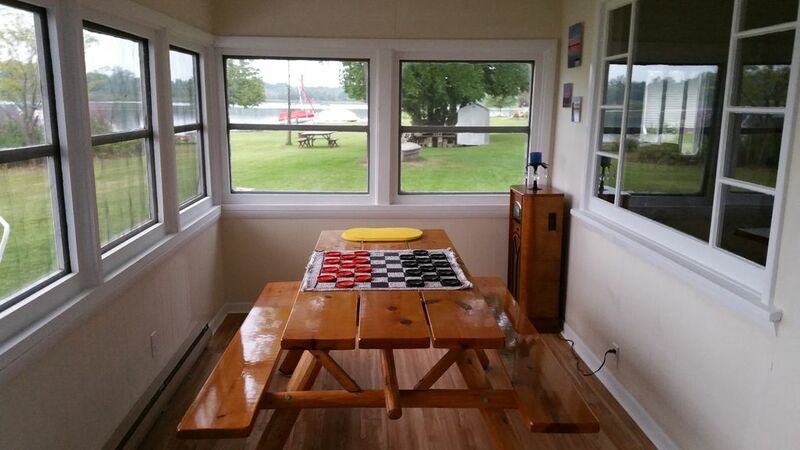 Kayaking, paddle boat, pontoon, fishing, bonfire, and great location on the water! We had an exceptional time and will definitely be back! Thank you so much!! We definitely plan on staying here again. We had 4 people for 2 nights and then 10 people when extended family joined. It was great even with 10. The second bathroom helps with the bigger group. The cottage was even better than expected. The pictures do not do it justice. Cottage has everything you need! Cottage was large and had everything you would need for your stay. The yard is perfect for entertaining, also came with kayaks and paddle boat. We had a wonderful time (despite the rainy/overcast day). Communication and booking with "the host" was fast and easy. I would highly recommend this property. Costs •	$125/night Sun. – Thurs. •	$175/night Fri. & Sat. Dogs welcome for an additional $25/night per dog.